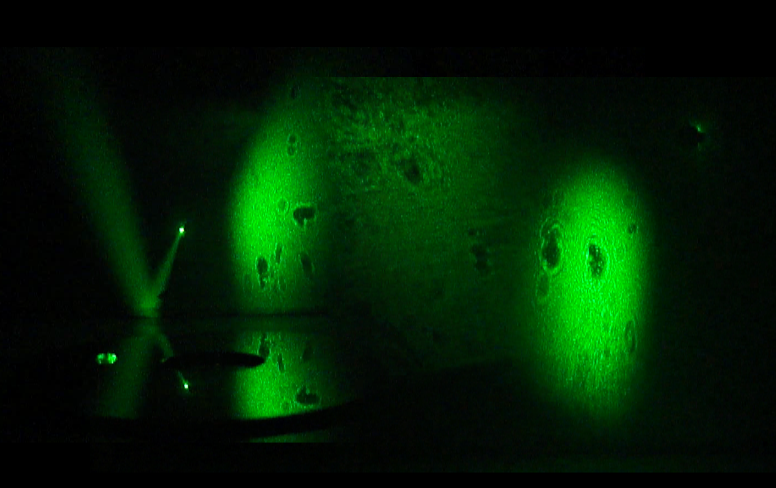 Protozoans in a water droplet, projected with a laser pointer beam. 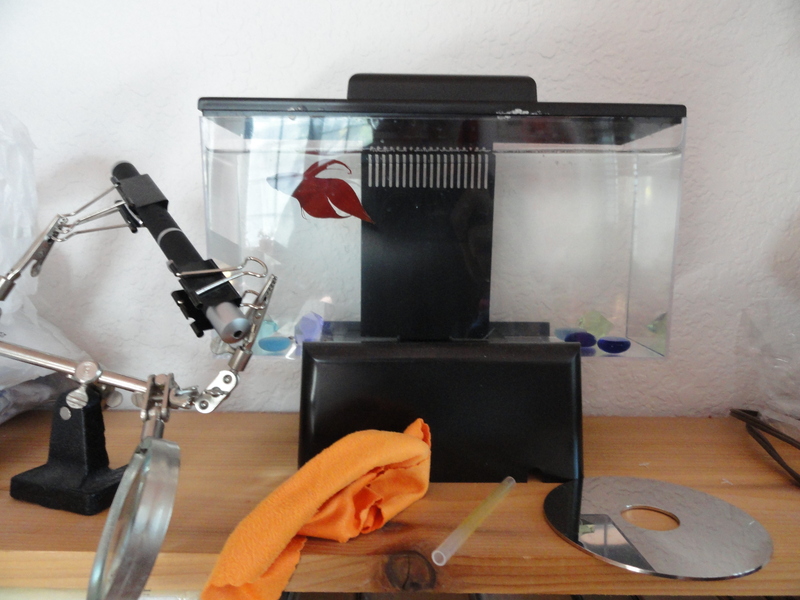 My setup of the laser pointer microscope. I used a hard drive platter as my mirror. A good thing to note is that some of the more geometric bodies that you see moving are actually very small organisms that are Rayleigh and Mie scattering in the laser light—the bodies themselves are too small to see, but they create a geometric interference pattern that appears to move with them through the water. The “Icelandic Spar” variety of Calcite exhibits double refraction when held against a sheet of text; the laser light reveals that this is due to its orderly internal lattice structure. Laser light is coherent, meaning that all the photons that comprise it march in phase—they never interfere with one another because they all take the same steps at the same time. This is incredibly useful because it not only means that all the photons have the same frequency—they take the same number of steps per minute—but it also means that they take identical steps (or are in phase). The reason is matters to the scientists is because, while light is indeed broken up into little particles of energy, these photons happen to act like waves in that they can interfere with one another and overlap, just as ocean waves give rise to complex eddies and lulls. Most light sources like incandescent light bulbs simply toss off photons with whatever phase and frequency happens to be most convenient, but lasers are designed to product barrages of photons that are coherent(have the same phase) and monochromatic(have the same frequency). This allows physicists to start out with no interference at all, and then to introduce various substances into the laser beam to see how they cause interference. Often the interference properties of a substance provide fundamental details about its microscopic structure. The basic idea of lasers is that an electric field causes many atoms in a gas to reach an excited state, or a state in which their atoms have reconfigured their electronic structure in order to hold additional energy. Most atoms would prefer not to hold this additional energy for long, and so after some time they will decay into their ground(normal) state, releasing the energy that they were hoarding as a photon. The trick to this process is that only certain changes in electron arrangement around the nucleus are physically possible, and so only certain changes in energy are possible. This means that gases are predisposed to emit photons with identical energies because their electrons spontaneously absorb and emit only photons that correspond to the allowed variations in electron distributions. The energy of a photon is directly proportional to its frequency(and thus color) via Plank’s law, which is why we know that the blue part of a candle flame is much hotter than the yellow(low frequency) part. Most elements have characteristic colors that they emit light at, as each element has a unique atomic geometry and thus a unique set of acceptable electronic configurations about their nucleus. The study of the characteristic colors, or spectra, of chemicals is the basis of spectroscopy, which I discuss in my post on incandescence. So lasers already have the monochromatic issue taken care of—they simply use a mixture of gases that ensures that atoms only spontaneously absorb and emit light at the desired color. But lasers are so powerful because they use stimulated emission— as a photon in a laser passes by an excited atom that has not yet released its energy, it can provoke it to release a photon that is moving perfectly in step with it. So in addition to being monochromatic, the light emitted from a laser is always coherent(in phase). There’s a reasonable explanation for how this occurs: according to the Pauli Exclusion Principle(or lack thereof for bosons, of which photons are a subclass), it is impossible to tell photons with the same set of properties apart. The basis of this is that photons, unlike objects we encounter in the macroscopic world, are able to overlap like waves. So if I place two photons in the same place, and everything about the two photons is the same, then I can never tell them apart. If a photon in a laser flies by an excited atom and stimulates a photon with a random phase to be released, however, there are two possible ways for the new photon to be in phase, but only one way for them to be out of phase. The reason for this is that there are two axes along which the photons can agree or disagree, but by the Pauli Principle all the disagreements appear to be the exact same, single state. This is rather unintuitive, but minutephysics provides a nice example with a quantum coin flip. The phenomenon is known as the consolidation of eigenstates(eigen is a German prefix that means “terrible algebra”), meaning that there end up being more options for the photons to stay in phase than to go out of phase, resulting in the former being statistically favorable. As a result, the number of photons in-phase gradually builds up until eventually the laser output is dominated by coherent light. d.
Posted on 12/24/2011 by gammacephei. This entry was posted in Biology, General Physics. Bookmark the permalink. 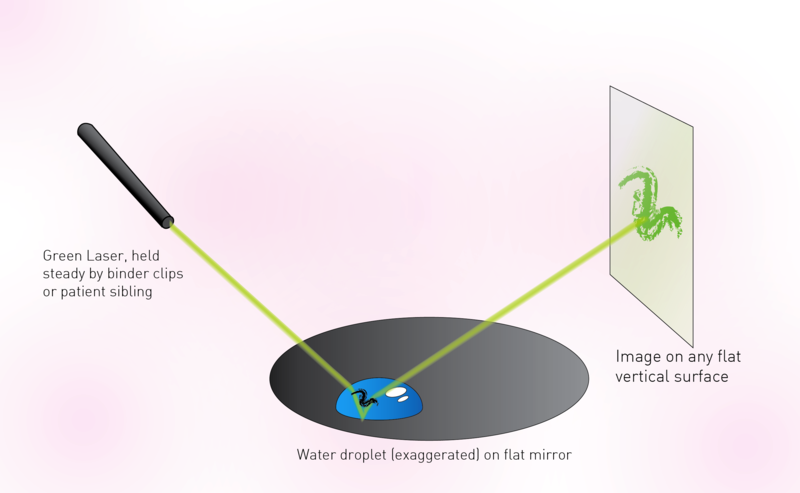 Hi – thanks for this page on laser microscopy – very interesting! But I have a question on the “crystallography” picture of green laser light through a piece of calcite: my calculations are that the wavelength of a green laser (~525nm?) is much too large to produce a diffraction pattern from a calcite crystal (which has inter-atomic distances on the order of 1nm?). So what’s going on here? I furthermore found that the size of the pattern did NOT scale with the wavelength! 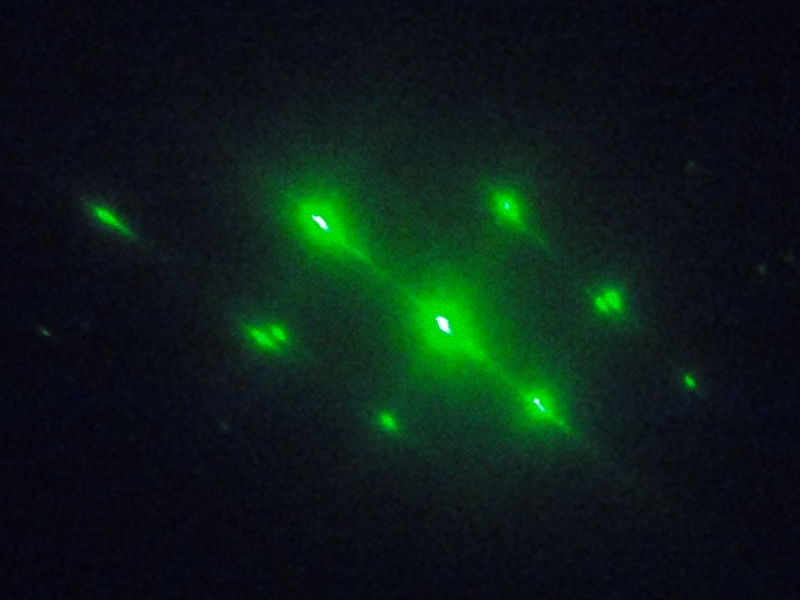 That is, a red and green laser showed essentially the identical size pattern (whereas for diffraction scattering, the distance to the maxima should be proportional to the wavelength of light used). I’m wondering therefore: what actually causes this pattern of spots? It sure LOOKS like it’s showing the molecular arrangement of the crystal, but I don’t understand the mechanism. thanks for any insights or feedback!